Sometimes just the thought of moving your mouse from one end of the screen to the other can cause an early onset of carpal tunnel. Especially with a touch pad, constantly gliding that thing over and over can get a rise out of the Dali Lama. 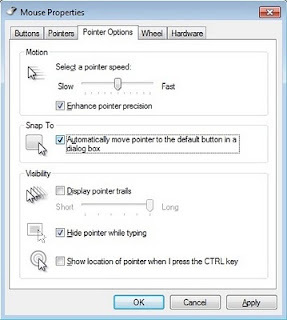 So for you Windows users out there, there's a quick solution that'll make your mouse action a little smoother. It's a handy little feature Windows has had for a while in the mouse control panel called Snap To. It's available for all the most current versions of Windows including XP, Vista, and Windows 7. We like it so much we make sure to add it to all the computers we repair and service here in our West Hollywood shop. What Snap To actually does is automatically move your mouse pointer over the default selection. For example, when you close a Word Document, wouldn't it be nice to have the mouse automatically snap-to the dialog box popping up asking you to save? Yeah, I thought so too. So to activate the snap to feature, you go to the Windows Control Panel and go to the Mouse applet. From there you select the Pointer Options tab and simply check the Snap To option. Then you're all set. From here on out, that mouse pointer will automatically move itself to the default button on a dialog box. Just like the screen says. What did you think I was lying? So do yourself a favor before you end up wearing a fancified glove for your wrist problems. You heard me! Snap to it! As always, coming strong from the 90046.